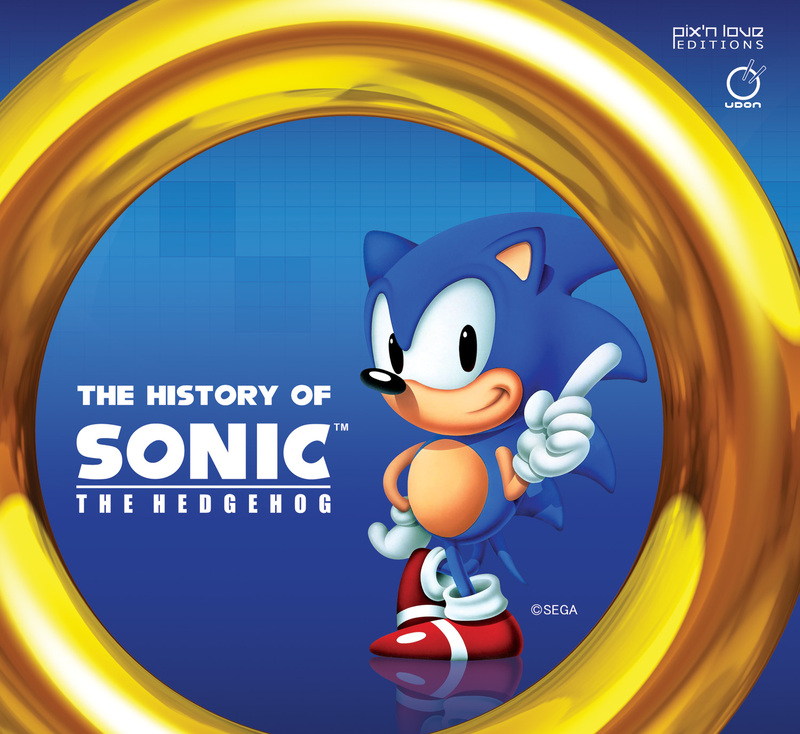 The History of Sonic The Hedgehog (note the capitalization of the “The”) is a glorious paean to everything about the Sonic video games, with full-color art on every single page! Sonic The Hedgehog has always been one of the more anthropomorphic video games, and he and his friends and enemies are described here in detail, with the differences between the Japanese and American versions pointed out. The book begins with a brief history of SEGA Entertainment before Sonic, listing their pre-Sonic video games. In 1983 SEGA’s American CEO, David Rosen, resigned and was replaced by Hayao Nakayama. It was Nakayama who decided to create a mascot for the company. The book shows some of the preliminary designs that were considered, such as a cartoon rabbit, a bulldog, a wolf, and an armadillo. The development went on for years. In 1989 Nakayama “had become obsessed with Nintendo’s success” in the video game industry, and ordered SEGA’s employees to decide on a mascot quickly. 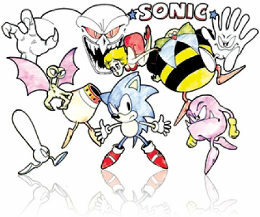 Sonic was chosen, a video game featuring him was designed and music was recorded. Sonic was first shown to the public at the Tokyo Toy Show in June 1990 and the International CES in Las Vegas in January 1991; was the subject of an advertising blitz in America to overcome Nintendo’s leading Super Mario Bros.; and was launched to great acclaim on June 23, 1991. The success of the even more popular Sonic 2 game a year later, which introduced Sonic’s twin-tailed fox cub pal, Miles “Tails” Prower, clinched the blue hedgehog’s position as SEGA’s corporate mascot. Pages 110 to 213 list every 2D and 3D Sonic game ever made, plus a few killed in the development stage. For the anthropomorphics fan, there are full-color illustrations of Sonic and the games’ other characters in sketch form, in pixel form, and as fully-rendered artwork. Pages 214 to 287 present a gallery of the Sonic characters: Sonic, Tails, Knuckles the Echidna, Dr. Eggman, Amy Rose, Shadow the Hedgehog, Silver the Hedgehog … there are twenty-three characters. The major ones get several pages each (Sonic gets ten), while the minor characters get only two pages. Speaking as an anthropomorphics fan who has no interest in video games, I am delighted with this book. It tells me all that there is to know about almost two dozen funny animal characters. If I have any complaint about this book, it is that it is about the video games only. There is nothing about the Sonic the Hedgehog 1996 animated movie or the four animated TV series, or about the long-running licensed Archie Comics comic-book series (since 1992) and its various spinoffs. As of the end of June 2013, there have been 249 issues in the main series, with enough comic-book only characters (notably Princess Sally Acorn the squirrel, Bunnie Rabbot the cyborg rabbit, and Snively, Dr. Eggman’s nephew) and original stories to fill another book like this one. But you can’t have everything. The History of Sonic The Hedgehog is so large and heavy already (9.3” x 8.5”; 2.8 lbs.) that adding similarly thorough coverage of the animated cartoons and the American comic book would make it too big to lift. If you have any interest in the unique blue hedgehog and his companions, get this book. Some Archie/SatAM characters have been in one Sonic videogame. Their cameo appearance was so short it is easy to miss. Sonic Spinball for the Sega Genesis was made by an American developer so it had influences from the animation series of the time. At the end of the first stage you'll play a bonus game where you have to break open containment units. Within those units from what I could tell were Bunnie Rabbot, Sally Acorn (in her "Toxic Coated" purplish pallet), Rotor, and Antoine. Those are the ones I remember seeing though. Antoine... well, may or maybe not on that last one released in the video, it doesn't quite look like him, maybe another character I'm not familiar with. First one released is definitely the pink pallet Sally.